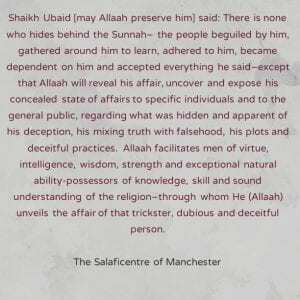 Shaikh Ubaid [may Allaah preserve him] said: There is none who hides behind the Sunnah– the people beguiled by him, gathered around him to learn, adhered to him, became dependent on him and accepted everything he said–except that Allaah will reveal his affair, uncover and expose his concealed state of affairs to specific individuals and to the general public, regarding what was hidden and apparent of his deception, his mixing truth with falsehood, his plots and deceitful practices. Allaah facilitates men of virtue, intelligence, wisdom, strength and exceptional natural ability–possessors of knowledge, skill and sound understanding of the religion–through whom He (Allaah) unveils the affair of that trickster, dubious and deceitful person. These claims were made against the backdrop of that clearly incriminating cut and paste fatwa Abu Usaamah tried to use. Abu Usaamah here is trying to annul the section in the fatwa where the question states “supports Abul-Hasan“. He thinks by doing so, he may once again dig himself out of the hole he has found himself in, by now claiming that he does not support Al-Maribi (as stated in the question in the fatwa), and therefore by extension say that this fatwa cannot apply to him?! So this statement was made by Abu Usaamah, after the proofs had been established against Al-Maribi. Yet he is trying to claim that the fatwa cannot apply because he was is not a supporter of Al-Maribi?! 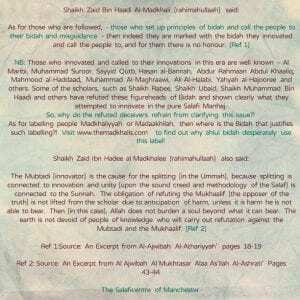 We can clearly see from the statement above, that ad-Dhahabi still elevated Al-Maribi (the innovator) with praise! He uttered words that put Al-Maribi in a favourable position, even going as far as adding some shubuhaat (doubts) about support for Al Ma’ribi from scholars. 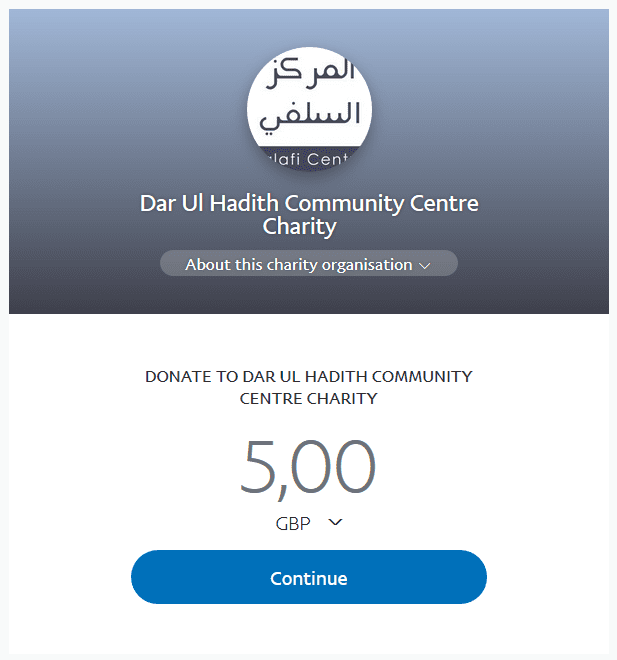 With regards to his doubt-ridden statement above the students at SalafiPublications (may Allaah preserve them) replied to the above statement (made by ad-Dhahabi). But let us all be clear and in no doubt of the position held by Abu Usaamah with regards to the innovator Abu Hasan al Ma’ribi when the question was asked about him. And with Allah lies the success. Abu Usaamah adh-Dhahabi, may Allaah guide him away from this Ikhwaanee fitnah, makes numerous references to TRUE Major scholars. And he also makes it a point to emphasise the word “TRUE”, keeping it in caps, and also in brackets, before the term “Major Scholars”. By this term he means to intend either the Imaams of the Sunnah who have recently passed away, or those from the Major scholars, who defend Abul-Hasan or do not share the same viewpoint as those who have refuted him and exposed him. ONE: When a reader reads his, he most probably thinks that therefore the TRUE major scholars are those who spoke good of Abul-Hasan al-Ma’ribee and did not criticise him or expel him from Salafiyyah. TWO: When a reader reads this, he is led to believe that Shaykh Rabee is not from the “TRUE” Major scholars, even if Abu Usaamah does not intend this, but this is what comes across to the reader, because the situation here for Abu Usaamah is one of vindicating himself and his false position on Abul-Hasan, hence he deliberately made it a point to emphasise the TRUE major scholars, and he connected this with the position on Abul-Hasan and defence of him. And we do not dispute that all those mentioned are in fact TRUE Major scholars, we are in agreement. But this is ends up with talbees upon the people, whether intended or not, because, we have to keep things into context. THREE: Imaam al-Albaanee said, “The carrier of the flag of al-jarh wat-ta’deel is our brother, dr. Rabee… and those who refute him do not so upon knowledge, rather to him is all the knowledge”. And Imaam al-Albaani here is not talking about the narrators of hadeeth, he is speaking about refuting the opposers to Salafiyyah. Imaam Ibn Uthaymeen also said, that Shaykh Rabee’ is one whose manhaj is Salafiyyah and he is very strong in calling to it, and the Shaykh also said that the only reason why people find fault with Shaykh Rabee’ and dislike his cassettes and make accusations against him is because he spoke about their figureheads from the contemporary latecomers. Shaykh Salih al-Fawzaan has many statements written and recorded in which he says that Shaykh Rabee’ is amongst those who have skilled and deep knowledge in refuting those who wish inhiraaf in the da’wah. And Shaykh Muhammad al-Bannaa has many statements about Shaykh Rabee also, and Shaykh Muqbil said that whoever Shaykh Rabee says is a hizbee, then it will become clear to you after some time that he is a hizbee. Also Shaykh Rabee is amongst the oldest of the scholars alive today. And don’t forget what Usaamah al-Qoosee (may Allaah guide him) used to say, that Rabee is the Imaam Ahmad of our times, he is a mihnah (test), he does not compromise nor lie, he speaks the truth, he is a whole manhaj, not just a person. So don’t forget this Yaa Abaa Usaamah, may Allaah guide you away from this Ikhwaanee fitnah. In light of all of this it is established that Shaykh Rabee’, is a TRUE major Scholar. So it is obligatory upon you to explain this to the people and not to allow the people to be deceived by these talbeesaat which exist in your bayaan. FOUR: For the readers, why is this is of significance. This is of significance, because Abul-Hasan al-Ma’ribee and those who are deceived by him like Abu Usaamah, are trying to wage a war against the principles of Jarh of the Innovators and Opposers. Al-Ma’ribee represents a line and tradition of people, who came before him, who brought about this war. This started with Hasan al-Bannaa with the principle, “Let us cooperate in that which we agree, and pardon each other (i.e. for the Shirk, Innovation, and misguidance), in which we disagree.” This principle abolished the idea of Jarh of the Innovators and these ideas spread by way of al-Ikhwaan into many different lands, thereby harming the Sunnah. 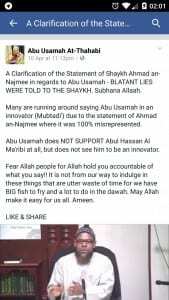 Then when the scholars refuted this and explained that there are sects that are headed for the Fire, sects of innovation and they are upon innovation and deviation and hence must be spoken about, and that there are Innovators and those who misguide who must be spoken about, this harmed the Ikhwaanee da’wah. So along came Abdur-Rahman Abdul-Khaaliq and Salman al-Awdah and Adnaan Ar’oor and they brought al-Muwaazanah. The evil innovation which makes it binding that when you refute someone, an innovator, a deviant, an opposer, you must mention his good points also. So the Major Scholars, amongst the Shaykh Rabee’ at the forefront, and then after him there followed Shaykh al-Albaani, Shaykh Ibn Baaz, Shaykh al-Fawzaan, Shaykh al-Abbaad, and many others who demolished this innovation. Then there came Abu-Hasan al-Maribee, and he brought some new principles, this time to try to demolish the jarh that would come from the scholars. And basically what he wanted to do was to refute the established principle, that a Jarh Mufassar overrules the ta’deel, even if the Mu’addiloon are many in number. So he layed down all his principles, of “tathabbut”, of “absence of taqleed”, “mujmal and mufassal” and many other matters, all to make as many excuses and ways out for those people whom the scholars would refute and criticise and convict with innovation or misguidance, where that was the case. This is what he did, he merely extended the Ikhwaanee war against the Salafees by way of this deception. And this type of speech you see also coming from Usaamah al-Qoosee and those with him in their loyalty to Abul-Hasan al-Ma’ribee. Pushing it in the minds of the people that the TRUE major scholars who passed away and Shaykh Abdul-Muhsin who is alive (hafidhahullaah), all have a different manhaj to those criticising Abul-Hasan al-Ma’ribee, and they all have a different manhaj to Shaykh Rabee. All of this is talbees upon the people. This is what this group of people are now doing both in the Arab lands, and also in the West to get this idea across to the people, so beware of it, and they are using the likes of these talbeesaat upon the people. They know that this is the case, even if they do not explicitly say it outwardly, they know deeply inside their own souls, that this is the propaganda they are forcing upon the people. Al-Ma’ribee has come out openly with this, but those who are with him like Usaamah al-Qoosee and those with him, are upon the same thing, but they are not so open and instead use other tactics, like coming out in the name of moderation, balance, equity, justice and so on. FIVE: So the point here is that we know that if one scholar, known to be upon the Sunnah, an Aalim, rather an Imaam in his field, knowing what he says, brings proof for what he says, is truthful, trustworthy, when he makes jarh upon an individual, and has a jarh mufassar, then it is obligatory to take his speech, even if those who oppose him and make ta’deel are many. And this is what has happened in the issue of Abul-Hasan al-Ma’ribee except that the issue is even more clear, because there are about 8 of the people of knowledge who have declared him outside of Ahl us-Sunnah, some of them made explicit tabdee’, and this number is growing, and those who know he is upon baatil and misguidance are very many also. So now, these people want to fight against this reality, and they want to the people to lose track of this important principle which is that the jarh mufassar takes precedence over the ta’deel. This is why if you read this bayaan of Abu Usaamah and also his previous writings, you find that they never ever go in this direction, to explain this point. Why because they themselves, (because they have been deceived by al-Ma’ribee), are actually waging a war against this principle. Al-Mar’ibee waged a war against this principle in order to defend Sayyid Qutb, and al-Maghraawee, and al-Ikhwaan and some of its figureheads. Hence, you see the likes of these talbeesaat and arguing by way of the mutashaabihaat and focusing the people in directions which make them lose track of what this matter is all about. So you never see them going in this direction, whereas the Salafees, as you have seen, they have made it clear to the people, the issue of Jarh Mufassar, and they have made it clear to the people, the difference between Jarh in narrators of hadeeth and Jarh of the Innovators and Mukhaalifeen, there are differences between these two subjects (even if there some similarities), so the Salafees have clarified the Usool in the manhaj, and you see the speech of the Salafees revolving around this, you see knowledge, you see fahm, you see the desire to clarify and explain. And as for the likes of Abu Usaamah and those upon the manhaj of Abul-Hasan, you only see confusion, no knowledge, and dodging the issues and confusing the people, and fleeing from the real issues that make up this fitnah. Instead you see examples, of what we have pointed out here, examples by which they keep away from the actual issue of Abul-Hasan, and the particular details of it and the established principles in the Salafee manhaj pertaining to Jarh of the innovators and deviants, and then most of their argument is centred around demonising the Salafees, they said this and did that, and tried to push this one out of the da’wah and that one, and accusing them of all sorts, whilst keeping away from discussing the actual issue, from an usool point of view, which has been the cause of all this fitnah: the Ikhwaanee manhaj of Abul-Hasan al-Ma’ribee. And also talbeesaat like the one that comes across here, which is trying to portray or link someone being a TRUE major scholar as being one who did not speak evil of Abul-Hasan. SIX: The summary here, is Abu Usaamah needs to openly acknowledge to the people, that Shaykh Rabee is also a TRUE major scholar who has criticised Abul-Hasan al-Ma’ribee and that he should not try to play these psychological games with his audience. And that by testimony of Shaykh al-Albaani, Shaykh Ibn Uthaymeen, Shaykh Saalih al-Fawzaan, Shaykh Muqbil, Shaykh Mohammad al-Bannaa (all of them major scholars), Shaykh Rabee’ is an Imaam in the field of refuting the Hizbiyyeen and the figureheads of Ikhwaan, and in knowing the people who “wish to cause deviation in da’wah” (as Shaykh al-Fawzaan said) and that by the admission of these scholars themselves, Shaykh Rabee’ is more knowledgeable and more skilled than them in this particular field. So we ask Abu Usaamah to openly announce this to the people, so as to not cause talbeesaat upon them. Then when he has announced this to the people, we then also ask him to openly announce and explain to the people the correct manhaj in the issue of when some scholars refute a person and others give him praise and see nothing that warrants him being refuted or having jarh made upon, and that there is a rule, an established rule that represents this manhaj that is to be adopted, which is that a Jarh Mufassar takes precedence over the ta’deel, even if the Mu’addiloon are many.